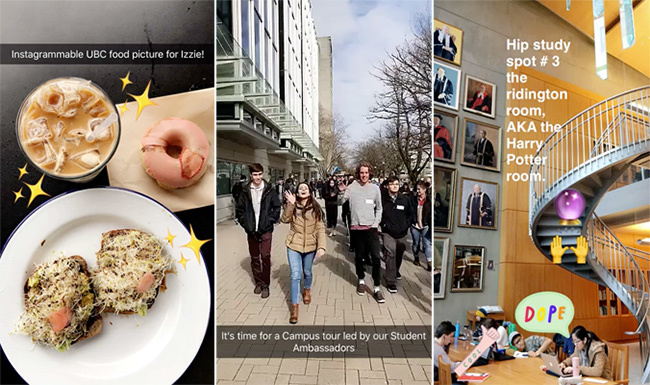 Browse: Home / Applying to UBC / Admissions Blog / Events, visits, and campus tours / Did you know that UBC’s on Snapchat? If you want to see what life looks like on UBC’s Okanagan and Vancouver campuses, check us out on Snapchat at youbcsnaps. You’ll have a chance to tour campus with our student ambassadors, deep dive into programs and degrees, follow co-op students on the job, and experience a day in the life of different UBC students. You’ll meet professors, see inside residences and campus buildings, and get the scoop on the best spots to eat, study, and hang out between classes.